Daidalos Villas is a newly built complex consisting of 4 maisonettes with sea view. 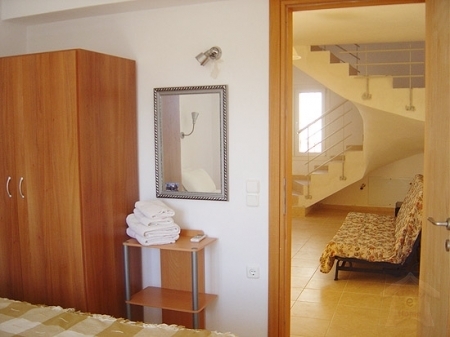 The maisonettes complex is located in Makrigialos just 80 m from the beach. The Villa consists of 4 housing units. The holidays apartments are designed to be next to each other with a private balcony with a fantastic sea view to the Libyan sea. The 2 bedroomed apartments - maisonettes are suitable for families with children and also for smaller groups. There are 3 big family maisonettes with 2 bedrooms, a big furnished private balcony with fantastic sea view. 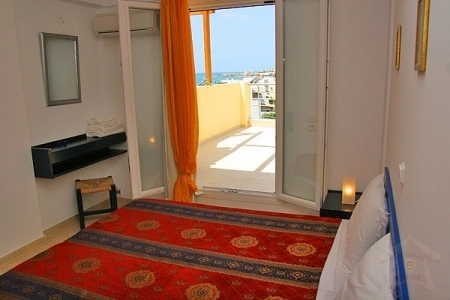 The 4th maisonette is consisting of one bedroom a living-room and a big private furnished balcony with sea view. All rooms are tastefully decorated. The place is wonderful and peaceful, the beaches are very clean and not crowded, the water is sparkling and you will really enjoy your relaxing holidays. You can reach the village centre and the port of Makrigialos in 4-5 minutes walk away. We hope to welcome you in one of our apartments-maisonettes. Daidalos maisonette 1 is consisting of 3 floors. The 3 rooms apartment-maisonette consists of 2 bedrooms, a living-room, a fully equipped kitchen with fridge and a coffee-maker, 1 bathroom with shower, 2 W.C and a big furnished balcony with a fantastic sea view to the Libyan sea, partially on the mountains. In each room, there is air-conditioning. A satellite TV is available too. It is 70sqm about. All rooms are tastefully decorated. Here you can spend relaxing holidays by the sea and enjoyable sightseeing. From the wonderful balcony you can enjoy your dinner or your drink in peaceful, looking the view to the horizon or watching the sunset colouring the sea with his rays. The 2 bedroomed holiday maisonette offers safety for the children. The peaceful area, the sparkling water, the long and not crowded beach, the Greek philoxenia offers a nice combination for really relaxing holidays especially for families with children or couples. Children are always welcome. Can be accommodated 4-6 people. Daidalos maisonette 2 is consisting of 3 floors. The 3 rooms apartment-maisonette consists of 2 bedrooms, a living-room, a fully equipped kitchen with fridge and coffee-maker, 1 bathroom with shower, 2 W.C and a big furnished balcony with a fantastic sea view to the Libyan sea as well as to the mountains. In each room, there is air-conditioning. A satellite TV is available too. It is 70sqm about. Beside the 1st bedroom there is another sleeping area and there can be accommodated 1 or 2 people. Here you can spend relaxing holidays by the sea and enjoyable sightseeing. From the wonderful balcony you can enjoy your dinner or your drink in peaceful, looking the view to the horizon. 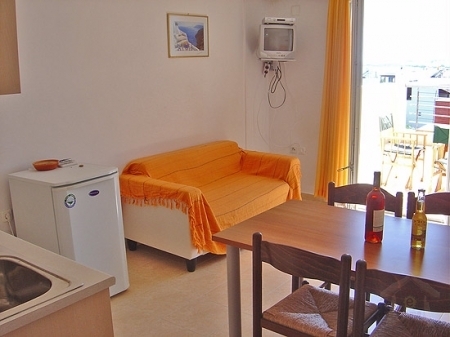 The 2 bedroomed holiday apartment-maisonette offers safety for the children. Children are always welcome. Can be accommodated from 4 to 7 people. Daidalos maisonette 3 is consisting of 3 floors. The 3 rooms apartment-maisonette consists of 2 bedrooms, a living-room, a fully equipped kitchen with fridge and a coffee-maker, 1 bathroom with shower, 2 W.C and a big furnished balcony with a fantastic sea view to the Libyan sea as well as to the mountains. In each room, there is air-conditioning. A satellite TV is available too. Beside the 1st bedroom there is another sleeping area and there can be accommodated 1 or 2 people. Here you can spend your relaxing holidays by the sea and enjoyable sightseeing. From the wonderful balcony you can enjoy your dinner or your drink in peaceful, looking the view to the horizon. The 2 bedroomed holidays apartment-maisonette offers safety for the children. Children are always welcome. Can be accommodated from 4 to 7 people. Daidalos maisonette 4 is consisting of 2 floors. On the 1st floor is located the bedroom, a bathroom with shower and on the 2nd floor is located a fully equipped kitchen with fridge and a coffee-maker, 1 W.C and a big furnished balcony with a fantastic sea view to the Libyan sea particially, on the mountains. In each room, there is air-conditioning. A satellite TV is available too. 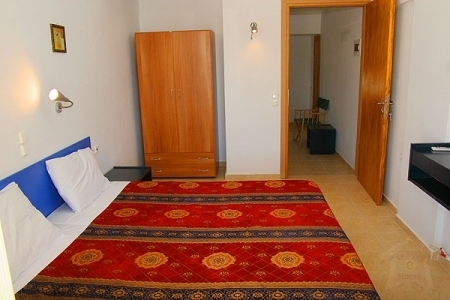 The 2 bedroomed vacation apartment-maisonette offers safety for the children. Children are always welcome. Can be accommodated from 2 to 5 people.